Preview 11/5 - 11/9 M-F, 8AM-4PM, NO APPOINTMENT NEEDED, NOT TO EXCEED 30 MINUTES. Removal 11/13 - 11/16, 2018 from 8AM-4PM Mon-Fri NO APPOINTMENT NEEDED. 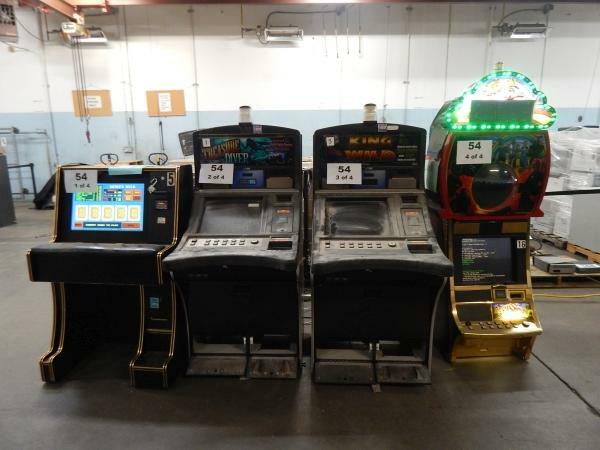 ALL BIDDERS MUST SHOW PROOF OF THEIR TEXAS COIN-OPERATED MACHINE GENERAL BUSINESS LICENSE OR OTHER AUTHORIZATION TO SELL/LEASE GAMING EQUIPMENT LICENSE PRIOR TO BIDS BEING ACCEPTED. Per Government Code, Sec. 2175.904, (b) DISPOSAL OF GAMBLING EQUIPMENT: The commission may sell gambling equipment only to a person that the commission determines is a bona fide holder of a license or other authorization to sell, lease, or otherwise provide gambling equipment to others or to operate gambling equipment issued by an agency in another state or in a foreign jurisdiction where it is lawful for the person to possess gambling equipment for the intended purpose. This lot consists of four machines. Machine one is a Super Bell Keno and does power up. Machine two is a Treasure Diver and does not power up. Machine three is a King of the Wild and does not power up. Machine four is The Wizard of Oz and does not power up. All of these machines are used and show signs of use and wear. Some parts or pieces may be missing. These are reported conditions and may have changed since the time of inspection. *NO OTHER INFORMATION IS AVAILABLE ON THIS EQUIPMENT. All items are in UNKNOWN WORKING CONDITON unless otherwise stated and are sold AS IS, WHERE IS with NO WARRANTIES implied or expressed. Item preview is highly recommended and bidding without previewing is strongly discouraged as terms and conditions regarding the sale and removal apply. 11/13 - 11/16, 2018 from 8AM-4PM Mon-Fri NO APPOINTMENT NEEDED. Please contact Judy Beers at 512-463-4908 or auctions@tfc.state.tx.us or for questions involving removal.